Visitors at “The Time Is Now! 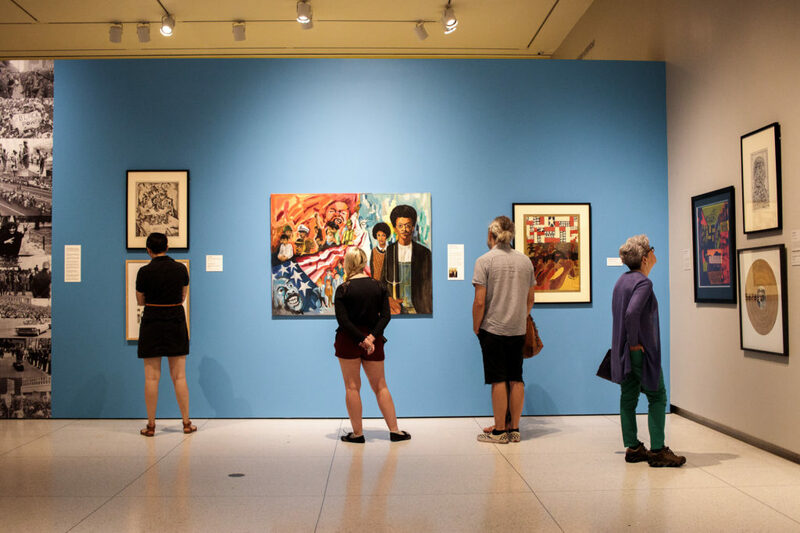 Art Worlds of Chicago’s South Side, 1960–1980,” which was on view at the Smart Museum of Art from September 13 to December 30, 2018. Chicago, IL—Initiated by the Terra Foundation for American Art, Art Design Chicago was a citywide exploration of Chicago’s role as a catalyst and incubator for innovations in art and design. The first large-scale exploration of the city’s art and design history to date, Art Design Chicago was developed over the course of six years and unveiled to the public in 2018 in the form of deeply researched exhibitions and innovative public programs across Chicago and beyond. Both anecdotally and statistically, the initiative was reported to be a major success, with 2.5 million visitors and participants at exhibitions and programs that were part of the initiative, and nearly 60 percent of exhibiting organizations reporting larger or significantly larger attendance than at their past exhibitions of similar size and scope. In total, Art Design Chicago involved 95 partner institutions who put forward an array of creative programs, projects, and lasting resources that deepen and expand understanding of Chicago’s legacy in art and design, including the publication Art in Chicago: A History from the Fire to Now from the University of Chicago Press, the first major survey on the subject, spanning the second half of the eighteenth century to the present. Art Design Chicago had a total financial investment of $7.9 million ($6.7 million from the Terra Foundation, with additional funds provided by Presenting Partner, The Richard H. Driehaus Foundation; and supporting partners, Leslie Hindman Auctioneers, the MacArthur Foundation, and the Joyce Foundation). Nearly 80% of the budget was used for grants to participating organizations for their exhibitions, programs, publications, and other projects. According to analysis by Choose Chicago, Chicago’s official destination marketing organization, Art Design Chicago had a total economic impact on Chicago of $55,121,770. The ingenuity and efforts of 95 cultural partners. These ranged from large cultural institutions like the Art Institute of Chicago, Museum of Contemporary Art Chicago, and Chicago History Museum to smaller and community-oriented organizations, like Edgar Miller Legacy, Hyde Park Art Center, Rebuild Foundation, and South Side Community Art Center. Other key partners included universities and their museums, such as the Block Museum of Art at Northwestern University, Museum of Contemporary Photography and Glass Curtain Gallery at Columbia College Chicago, and Smart Museum of Art at the University of Chicago. Research libraries and repositories participated as well, such as the Chicago Film Archives and Newberry Library. The Chicago Public Library, Chicago Park District, and Illinois Humanities Council also took programming into neighborhoods across the city. The presentation of 46 exhibitions, 36 scholarly convenings and symposia, 29 publications, 15 new digital resources, and more than 300 public programs that engaged a wide range of audiences with talks, tours, block parties and festivals, film screenings, hands-on workshops, and other content-rich events. In total, across its varied and dynamic projects, Art Design Chicago presented the vision and work of more than 700 artists and designers who lived and/or worked in Chicago. Many of the Art Design Chicago projects examined artists and designers who hadn’t been the subject of close study before, requiring extensive research and resulting in new scholarship. Among the many cultural figures whose voices were resurrected and whose work was newly presented through exhibitions are Ralph Arnold, Charles Dawson, Morton and Millie Goldsholl, Yasuhiro Ishimoto, Barbara Jones-Hogu, Kenneth Josephson, Bill Walker, and Charles White. Art Design Chicago projects were presented in 35 of Chicago’s 50 wards, with additional events outside of Chicago and the United States. Using attendance data provided by partners, the Terra Foundation estimates approximately 2.5 million people engaged in exhibitions and events during 2018. The initiative also featured quarterly “Neighborhood Days,” family-friendly festivals that encouraged attendees to visit multiple institutions on a single day to experience the diversity of programming offered. Exhibitions and programs were seen throughout the city as well as in suburban areas, and many exhibits have or will travel to other North American cities, including New York City, Los Angeles, Minneapolis; and European cities including Amsterdam, Lausanne, Linz (Austria), London, Madrid, Paris, and Venice in 2019 and 2020. A survey of Art Design Chicago audiences found that 68 percent attended three or more exhibitions or events focusing on Chicago’s art and design history in 2018, while 20 percent of those surveyed attended seven or more. In a coup for Chicago’s arts community, the initiative motivated audiences to visit institutions that were new to them, with 42 percent reporting they visited one or more cultural institutions for the first time to view an Art Design Chicago exhibition or participate in an event, and many indicated they planned to return to those institutions in 2019. Young people also were given the opportunity to enjoy and learn about the work of Chicago artists and designers, with more than 5,000 Chicago Public School students (predominantly from schools in the city’s South and West sides) exploring Art Design Chicago exhibitions. The Terra Foundation and its many partners envisioned Art Design Chicago as a beginning—an initiative that would be a catalyst for new ideas, collaborations, and additional scholarship. Below is a selection of commentary provided by partners regarding their experiences with Art Design Chicago. “First and foremost, Art Design Chicago gave me the opportunity to strengthen my relationships to many colleagues in Chicago, and to meet people I hadn’t met before. I also got to know and understand institutions I was only vaguely familiar with. These connections will undoubtedly prove beneficial for future projects. This initiative also proved that our institution can be extremely ambitious in our projects, plan longer term, and attract entirely new audiences. Our collection grew, our collective knowledge of Chicago art history increased, and we collaborated more than ever before,” said Karen Irvine, Chief Curator and Deputy Director, Museum of Contemporary Photography at Columbia College of Chicago. “Art Design Chicago provided an opportunity to connect Jane Addams scholars with contemporary artists, to transform thinking about the ways in which progressive movements have contributed to the arts in Chicago. Scholars expressed new perspectives about the reach and impact of fresh research, and the participating artists found a lot of power in connecting with an artistic legacy. For Jane Addams Hull-House Museum, introducing new ideas to an old narrative has been very exciting,” said Ross Jordon, Curatorial Manager, Jane Addams Hull-House Museum. “So often contemporary artists see their work as situated in the present moment, stemming from their current situation and experience, but Art Design Chicago encouraged them to see their work as part of an evolving continuum related to a history shaped by artists, thinkers, and designers,” said Tricia Van Eck, Artistic Director, 6018North. Additional details are also available on the Art Design Chicago website, www.ArtDesignChicago.org. Art Design Chicago was a spirited celebration of the unique and vital role Chicago plays as America’s crossroads of creativity and commerce. Initiated by the Terra Foundation for American Art, this citywide partnership of 95 cultural organizations explored Chicago’s art and design legacy and continued impact with 46 exhibitions, more than 300 events and programs, as well as the creation of 29 new publications, 15 new digital resources, 36 scholarly convenings and a four-part public television series presented throughout 2018. Support for Art Design Chicago was provided by the Terra Foundation for American Art and Presenting Partner, The Richard H. Driehaus Foundation. Additional funding for the initiative was provided by Leslie Hindman Auctioneers, the John D. and Catherine T. MacArthur Foundation, and the Joyce Foundation. The Chicago Community Trust, Leo Burnett, Polk Bros. Foundation, and EXPO CHICAGO provided in-kind support.